cms.PSU.edu GIS technology is becoming commonplace as hardware & software costs continue to drop. As a Civil Engineer specializing in Geoenvironmental Data Management, I need to understand how GIS technology can help turn raw data into useful information. I have considerable experience with site-specific data management and I have learned additional "big picture" data management and analysis skills through these four online courses. This personal application of mapping technology helps one relate to coordinate and mapping projection study materials. Click the above link to see where we live near a Great Lake. A recent election had me wondering where the local election district boundaries "were drawn". The ability to choose from a wealth of Census data answered that question and some real estate questions too. For example, our town has a large number of rental properties and there appears to be a large number of rental units available for rent. I wondered how the other towns in the county compare. The Choropleth mapping exercise makes it easy to make this comparison. The National Hydrography Dataset (NHD) is of particular interest to Civil Engineers and other professionals practicing in the areas of water resources, dam safety, watershed management, flood control, irrigation, drainage, hydraulics, hydrology and infrastructure (such as bridges, roads, and storm sewers). My first project out of graduate school, a probable maximum flood determination for a dam safety study, involved laboriously measuring hydrographical information from USGS topographic maps. Much of the topographic information is now available in multiple digital formats and is accessible via GIS tools. Where should the ice cream store go ? An introduction to spatial and attribute based site selection with ArcView 8.3. Tornado property damage in central Oklahoma on May 3rd, 1999 is presented using ArcView 8.3 to produce thematic maps with an overlay of actual tornado touch-down paths. How can a GIS system help target relief efforts after a major series of storms with Tornado damage ? Project 2 data is combined with a public facilities layer to select possible relief sites near the areas with the most likely need. Spatial data can often only be located based on a street address. So how can an address be converted to a geographic location ? Project 4 provides a home address geocoding exercise combined with a simplified radon gas risk analysis. This project produced our first traditional looking map designed for printing and standalone usage. ArcView 8.3 is very capable of producing printable maps suitable for most purposes as demonstrated by the "White Deer Township Zoning" map. Where is the acreage most suited for vineyards in (a small portion) of Napa County, California ? Project / Lesson 7 considers seven different criteria to identify the most desirable vineyard acreage. The ArcGIS Spatial Analyst extension is put to work in this project. We have identified Priority Conservation Areas in Centre County, Pennsylvania without a "guide book". Each student had to submit a Work Flow to the instructor for approval based on the supplied data and project instructions. This is a relatively complex analysis so multiple approaches are possible and each student was free to choose their own path. Lesson 1, "Data Input" and Lesson 2, "Data Correction & Integration" do not have published projects here. Instead, the personal geodatabase was e-mailed to the grader twice. Lesson 1 gave us some hands-on "Heads-Up" digitizing experience. Lesson 2 had us find and correct mistakes in an adjacent area to the Lesson 1 study area then merge the two sets of GIS layers together. Two map images "lost in space" are georeferenced using explicit X & Y coordinate points assigned to the control points. A photo of State College (PA) is also warped to fit major road intersections in a shape file. Lesson 4 teaches the basics of relational database design. This gave me a chance to see how ArcCatalog and ArcMap are able to work with "personal geodatabases" in Microsoft Access mdb format. A data set of Census Block Group information was downloaded from a clearing house and prepared for usage in Project 6. This Lesson leads the student through the creation of a spatial data set that is joined with 2000 Census data from Project 5. Some of the data is then presented using thematic mapping. The first programming project includes some simple ArcView user interface customization and a classic "Hello World" exercise in the ArcMap 8.3 VBA (Visual Basic for Applications) event-driven environment. Only Lesson 1 has a personal posted project. The Final Project was a group effort and the user manual was posted online. The in-between lesson projects and the final project included sending the instructor either an ArcMap document or a template file. 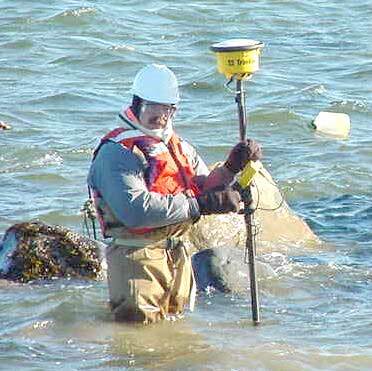 Trimble Total Station 4800 GPS instrument shown with Tom Wells on site in Long Island Sound. Click on the picture to see the Trimble Total Station 4700 GPS base station used to correct the "rover" instrument.